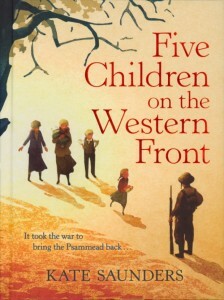 Five Children on the Western Front, by Kate Saunders, is a modern sequel to the Psammead books by E. Nesbit, which began with the classic Five Children and It. It moves time on a few years from the original books; it is now the beginning of the Great War, and the children, some of whom are now more-or-less grown up, find that their lives are dominated by the war. The Psammead, or sand fairy, the “It” of the title, who in the original book was a grumpy wish-granting imp who lived in a gravel pit, encounters the children again; but things have changed. The children are older; the baby, known as the Lamb, is now a boy, and there’s even a new little sister, Edie. But more importantly, the Psammead is no longer in control of his magic, and can’t indulge the children’s whims. Instead, his magic is guided by something else… something that appears to be guiding him towards repentance for his past. Each bit of magic shows the children something of the war, and casts light on the Psammead’s history. This is a book with a great deal of humour, mostly arising from the grumpy Psammead and his somewhat shaky grasp of modern life. It’s also a book with rich mythology behind it, with the investigations into the Psammead’s time as a desert god (a vindictive and nasty desert god) many thousands of years before. It’s also a book that looks at the changing social attitudes of the early years of the 20th century, particularly in the form of the young working class soldier and scholar Ernie. But most of all, it’s a story about loss, and the horrors of war. Cyril goes from a young, naive Lieutenant looking forward to the adventure of war, glad that he’s got the opportunity to see some action before it’s all over, to a grim-faced veteran writing good-bye letters every time he goes over the top. The book does not shy from the deaths and crippling injuries that the war produced. While there are no graphic descriptions of injuries, there’s enough horror to upset a child. Hell, I’m 44, and there was enough to upset me. But it’s not something children should be shielded from. I do worry that this is one of those children’s books that’s mostly read by adults who’ve read the original and seen the glowing reviews and prizes that have been heaped – deservedly – on the book. Because that would be a waste. It’s a book that children should read, and maybe cry over, and then talk to a parent or a teacher about. If there’s one small criticism I have, it’s that book depicts the effects of war as almost entirely physical rather than psychological. People are horribly maimed and yet stay almost relentlessly cheerful. But then, a depiction of shell shock and other psychological horrors in the vein of Pat Barker’s Regeneration would perhaps be a step too far for a children’s book. Kate Saunders has written a rich, layered, beautiful and terribly sad book. Highly recommended.